A mixture of re-enactment and newsreel footage depicting events in Britain and the Empire during the reign of King George V, linked by a freshly minted penny in 1911 passing through the hands of numerous characters throughout the period. A statement on-screen following the main title says 'In Commemoration and Celebration of the Jubilee of His Majesty King George the Fifth'. From the Falkirk Herald 11 May, 1935. 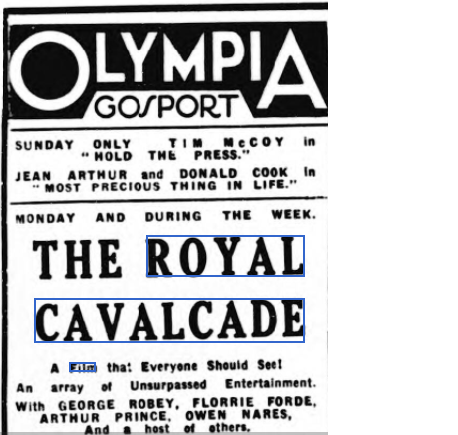 At this time of Jubilee celebration, what more appropriate film could the public wish for than “Royal Cavalcade,” which is due at the Regal on Monday for six days. Every patriotic Briton will be particularly anxious to see this picture, which puts the events of the past 25 years into a very human story, containing comedy, thrills, emotion, and tragedy. 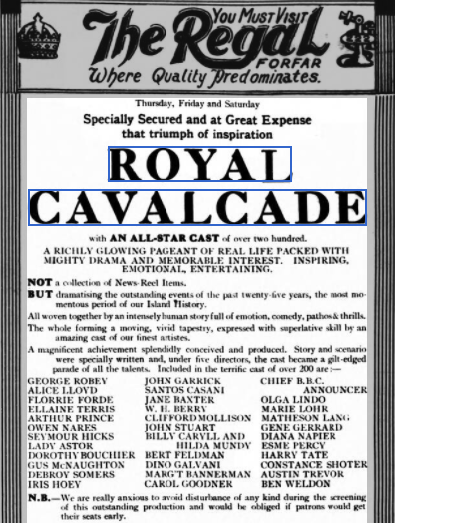 The time available for the production of “Royal Cavalcade” was very short indeed, and the story and scenario were specially written to commemorate the great event of the Silver Jubilee, but never the less the work has been so efficiently discharged as to give one the impression that the entire film had been planned and rehearsed many months before. 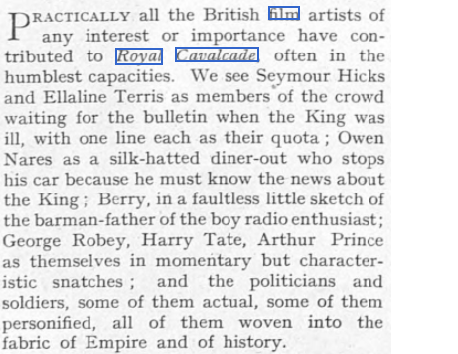 The cast, consisting of some 130 names, includes such well-known and popular screen artistes as Margaret Vines, Charles Mortimer, Margaret Bannerman, Jane Baxter, W H Berry, Marguerite Allan, Joyce Bland, Judy Kelly, Jimmy Godden, Clifford Mollison, and Florrie Forde, while a few of the personages represented are Lloyd George, Lord Snowden, Queen Victoria, Edward III, Charles II, and Winston Churchill. While the purpose of the picture is to give history of the events of the past quarter of a century, cinema “fans” can be assured of an entertainment with unique attractions. The film goes with swing, and with such a brilliant cast, interest is maintained from beginning to end. The screen play is by Marjorie Deans. From The Portsmouth Evening News - Saturday 25 May 1935. From The Bystander - Wednesday 24 April 1935. ....and Charles Mortimer!! 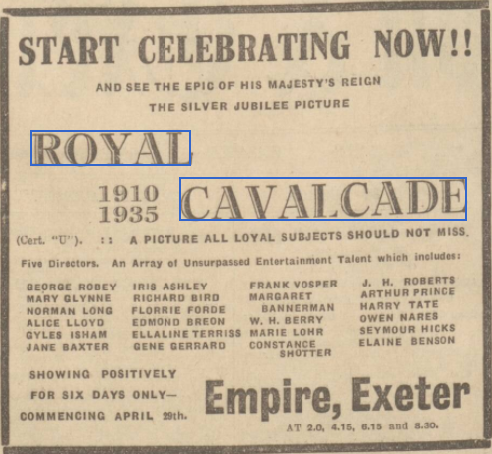 From The Exeter and Plymouth Gazette - Friday 26 April 1935. ....and Charles Mortimer!!! From The Forfar Dispatch - Thursday 13 June 1935.